The Golden Globes feel more difficult to predict this year than most. With category placements for films like Three Billboards in Drama, Get Out in Comedy and Beatriz at Dinner (which is appealing its Drama ruling) the line of what defines a film’s genre keeps getting muddier each year. The split of the top categories made more sense in the era of the movie musical but far less so today. What qualifies as a comedy now would never have at that time either. But, here we are. 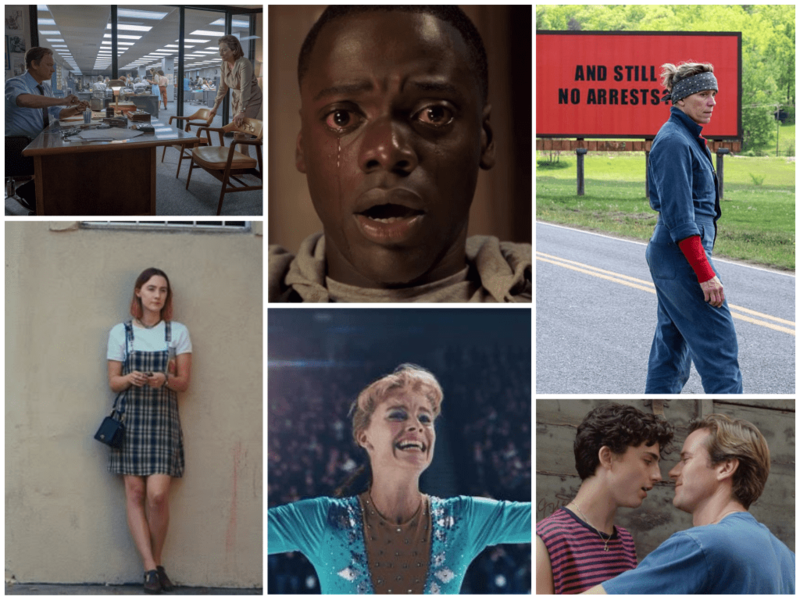 There are some real nail-biter categories this year, especially the big ones – Motion Picture Drama and Comedy/Musical. In Drama, I have six films contending for five spots and there is a case to be made for all of them to be in but not really for any one of them to be left off. I imagine it will be a tough decision for the 90+ HFPA voters and the difference between the 5th and 6th spot could be as little as one vote. That nomination race should be between Call Me by Your Name, Darkest Hour, Dunkirk, The Post, The Shape of Water and Three Billboards Outside Ebbing, Missouri. Something else sneaking in (Mudbound, perhaps) would mean two top contenders would fail to make the cut. Last year I got four of five in Motion Picture Drama (I had Fences in over Lion) and I think there’s a good chance of that again this year. Nailing the top 5 here will be some good predicting. The last two films the HFPA will see this season before voting are The Post and then Phantom Thread right on the deadline. While I don’t think Phantom Thread will be among the top 5, The Post most surely will be. Or will it? Is it the weak link? How could it be when Spielberg, Hanks and Streep are such huge Globes favorites? I feel like Darkest Hour and Call Me By Your Name feel the most vulnerable, which itself seems crazy as Gary Oldman is certainly a Best Actor lock and Call Me By Your Name could find itself with three acting nominations, not to mention Director and Screenplay. How would it get all of that and then miss out? Motion Picture – Comedy or Musical is equally as tough, even with Three Billboards out. Battle of the Sexes, Get Out and Lady Bird seem like locks. But then what? There are two bonafide musicals to consider – Beauty and the Beast and The Greatest Showman, both of which could stake a claim here. The former is the live action version of a classic animated film and is the highest grossing film of the year and the latter is an original musical from the songwriter’s of last year’s La La Land, the film with the most Golden Globes wins of all time. After that you have to consider the sleeper hit The Big Sick (which should earn two acting nods), The Disaster Artist (a sure bet for James Franco) and I, Tonya (which feels like an win in store for Margot Robbie). Not to mention Downsizing. Alexander Payne’s films have always done well with the HFPA. His last four were nominated in Motion Picture (both sides), with The Descendants winning Drama in 2012 and Sideways winning Comedy or Musical in 2005. The big difference is that Downsizing does not have the reviews that Payne’s previous films had. At the moment I’m seeing a shutout of the musicals and of Payne at the top with the two films I see as winning the comedy lead acting categories filling it out. The nominations for the 75th Golden Globes will be announced on December 11, 2017. Here are my predictions.